This English Gardens small group tour allows you to enjoy the undoubted highlight of the British gardening year, the Chelsea Flower Show. This extraordinary event boasts award-winning gardens and resplendent flower displays. With this renowned show as its centrepiece, this week-long tour explores London and the charming county of Kent, known as the “Garden of England”, along the way we’ll celebrate some of the most iconic, creative and inspirational historic houses and gardens in England. Departing London we embark on a journey through England's green and pleasant land. Our tour begins at one of its most unique manor houses at Ightham Mote, a medieval, moated manor house and deservedly one of the most popular small gardens in the region. Dating back nearly 700 years ago this house has been owned by medieval knights and courtiers to Henry VIII. Highlights include the Great Hall, the Tudor painted ceiling and the peaceful garden and orchard. 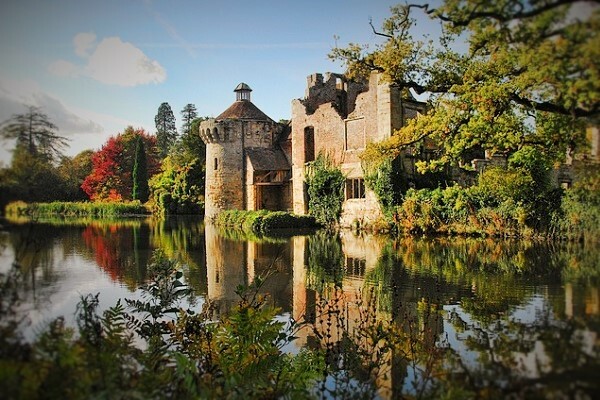 This afternoon we visit Scotney Castle, in the care of the National Trust, Scotney is a romantic 14th century fortress nestling amongst picturesque gardens and over 770 acres of woodland and parkland. By evening we continue to the historic spa town of Tunbridge Wells where we enjoy a dinner together. 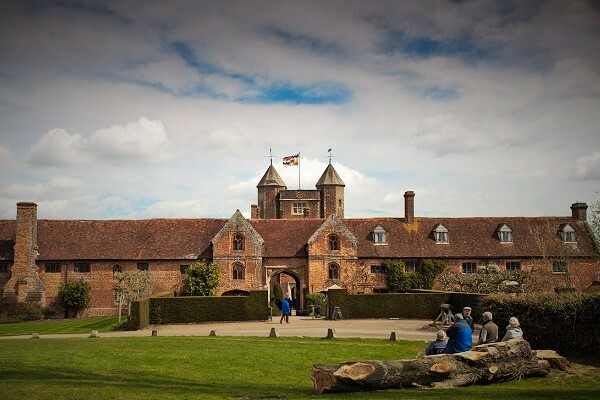 Today we travel to the beautiful Sissinghurst Castle Gardens, created by novelist Vita Sackville-West and her husband Harold Nicolson in the 1930's. Set around a manor house dating back to the middle-ages, the stunning formal gardens were designed as a series of rooms each bursting with different colours and themes and each offering a glimpse in to the next; visit the rose garden, the white garden and the cottage garden or stroll around the Elizabethan tower and parts of the original manor house. Later we continue to another English icon and the largest half-timbered house in England, The Great Dixter parts of which date back to the 15th century and which is surrounded by stunning gardens. The Arts and Crafts style garden features topiary, an orchard and a wild flower meadow. This morning we visit the magnificent 13th century Hever Castle, once the childhood home of Anne Boleyn, Henry VIII's second wife. 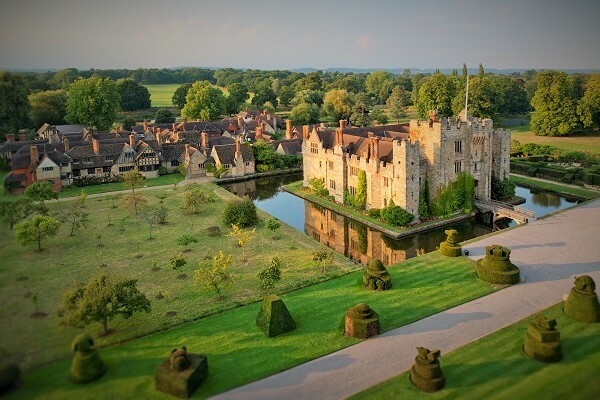 The unique double-moated castle is home to an array of Tudor antiques and artefacts whilst the surrounding 125 acres of spectacular gardens offers visitors plenty to discover including the yew maze, water maze, rose, herb and topiary gardens. Then it's time to while away the afternoon in the peaceful environs of RHS Garden Wisley. Soak up the sounds of water flowing though the rock garden, or relax in the Alpine meadow, before we continue to historic Windsor. Our day today begins with free time to explore Windsor at your own leisure. What better way to spend it than discovering Windsor's regal highlights? You may catch the changing of the guard; listen out for the sounds of drums and see the royal guards, in their classic red uniforms and tall 'bearskin' hats, march up to the castle gates. 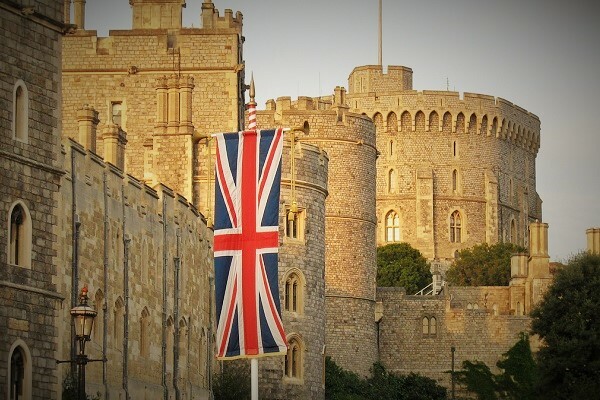 You may choose to visit Windsor Castle itself, one of the oldest in inhabited forts in Europe. Later we reconvene to visit Savill Garden, an enclosed area of the Windsor Great Park; it is one of Britain's greatest ornamental gardens, enjoyed by horticulturalists and enthusiasts alike. Boasting 35 acres of contemporary and classically designed gardens and exotic woodland, the garden combines native and exotic species and has bred many important garden hybrids. Swapping English country houses for an elegant French château, our journey this morning takes us to Waddesdon Manor. Designed by Baron Ferdinand de Rothschild in the late 1800s, Waddesdon is inspired by Renaissance-era Gallic grandeur, both inside and out. We'll feast our eyes on the intricate parterre garden, and listen out for birdsong in the rococo influenced aviar. Then we make our way to Cliveden House, an Itlianate Mansion which would not look out of place in an episode of Downton Abbey. 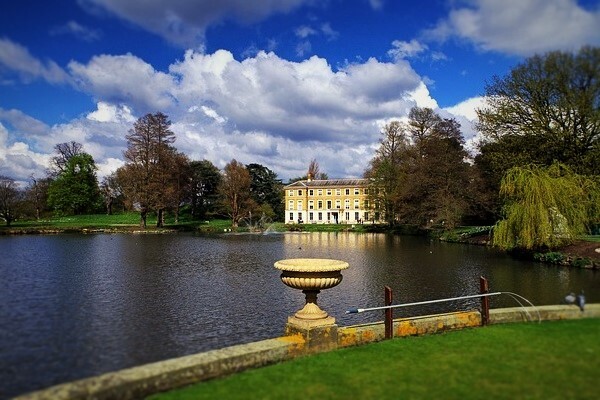 Known particularly for its links with the Astor family, the house is surrounded by 376 acres of magnificent formal gardens and parkland which offer wonderful panoramic views over the River Thames and the Thames Valley. Today we have the pleasure of experiencing the most prestigious flower show in the world at the RHS Chelsea Flower Show which has been held annually since 1913, apart from gaps during the two World Wars, in the grounds of Chelsea Hospital. Closely associated with the Royal family, the opening of the show is attended each year by one of the Royals. We get to behold the array of contrasting award-winning feature gardens, learn new gardening tips and admire the magnificent flower displays in the Grand Pavilion. With so many inventive ideas and beautiful sights to enjoy, this truly is a dream come true for anyone who loves flowers and gardening. Tonight, we enjoy a farewell dinner together at our hotel. Our final day begins with a journey to one of England's most famous gardens, renowned throughout the world, the Royal Botanic Gardens, Kew. Home to over 300 acres of beautiful landscape and an outstanding collection of plants these "must-see" gardens receive UNESCO World Heritage status. Highlights include the Treetop walkway, the Water Lily House and The Princess of Wales Conservatory dedicated to Lady Diana. Our tour ends this evening in central London. Enjoy entry in to the spectacular Chelsea Flower Show. 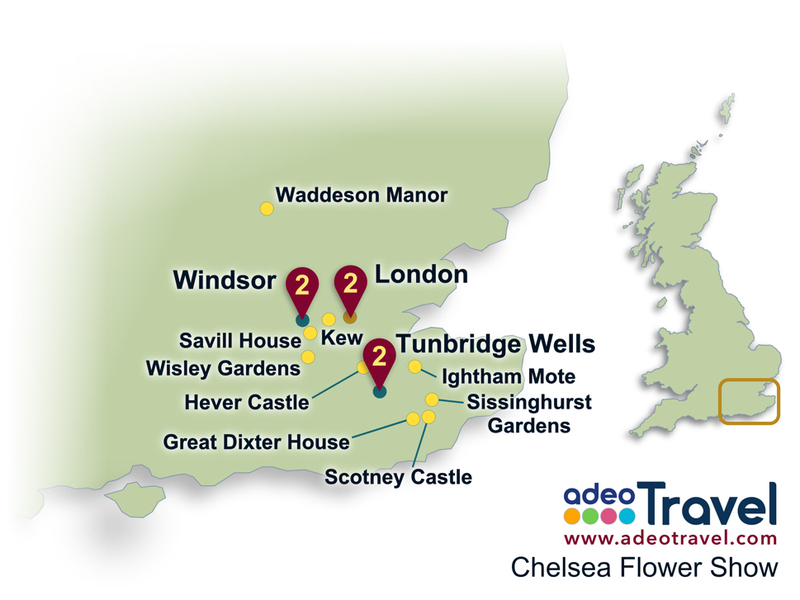 Explore historic castles, stately homes and open gardens throughout the South East of England. Maximum group-size of 18 passengers for that intimate touring experience. Expert local advice during the planning of your trip. Postage of your vacation documents pack. Pre or post tour hotel accommodation in central London. There are a number of dates where more than one departure will be running at the same time but each group stays in different hotels and visits the Chelsea Flower Show on different days. There are also departures where the itinerary is reversed but all the same gardens will be visited. Please note, this is a popular tour with limited departure dates. Our advice is to book early to avoid disappointment. Please select your preferred tour date from the list below. * Prices are per person based on two people sharing either a double room or twin room. A single supplement will apply for those bookings where a single room is required. All tours commence at 8.30am in central London on the start day and finish at around 5.30pm (approx) in central London on the End Day. Prices are per person based on two people sharing a twin/double room. Prices are for land only tours and all tours are subject to availability. Prices are correct at the time of publishing to website but are subject to confirmation at time of booking. Prices are in British Pounds Sterling (GBP£) currency for approximate amounts in other currencies please contact us. All trip details are correct at time of publishing to website however due to the nature of small group tours the itinerary is flexible and is subject to change based on a variety of factors. Please note: Multiple mini-coaches may operate for this event. In order to keep with the small group ethos, each group will follow a different daily itinerary. Whilst all of the gardens and stately homes listed in the itinerary will be visited, the days in which they are visited and the order of the visits may vary.